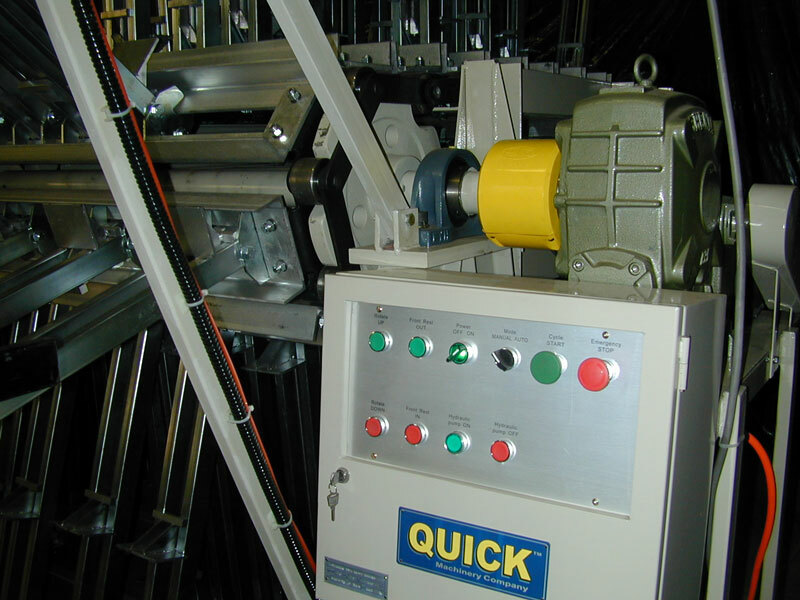 We at Quick Machinery Company realize that when choosing your edge-gluing equipment, you have a choice of manufacturers. We encourage you to research your options very thoroughly. We believe you'll want to buy the heaviest-duty, most productive, highest-value equipment that you can find. Being engineers, we at QUICK do our best to recommend our machines on their objective merits alone; we try to never degrade our competitors' companies nor insult our customers' intelligence with arrogant or empty sales bluster. Our customers are generally quite competent technically, and we present our equipment to them (and you) accordingly. 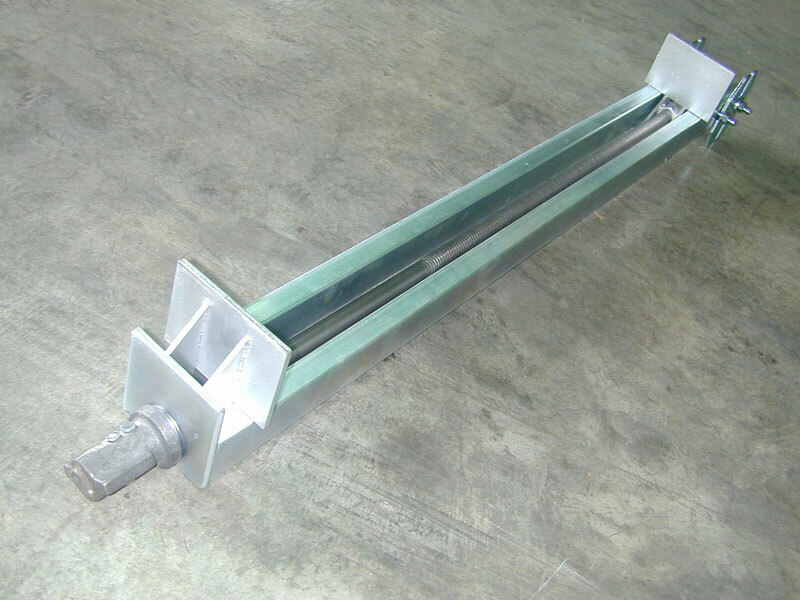 The QUICK 6-Section Clamp Carrier frame has a 2" diameter main shaft and 6" I-beam legs. For more details, please see our 6-Section Clamp Carrier page. The QUICK 14-Section Clamp Carrier with "standard" frame has 2" diameter main shafts, cast iron sprockets and 2" x 4" structural steel tubing legs. For more details, please see our 14-Section Clamp Carrier page. The QUICK 14-Section Clamp Carrier with "heavy duty" frame and all QUICK 20-Section and larger Clamp Carrier frames (left) have massive 3" diameter main shafts, large cast iron sprockets and 6" I-beam legs. For more details, please see our 14-Section Clamp Carrier page and 20- to 80-Section Clamp Carriers page. Our competitors' machines, even their largest ones, generally have only 2" diameter main shafts (a 3" shaft is four times as strong, torsionally, as a 2" shaft), smaller-diameter, lighter-weight sprockets, and lightweight rectangular tubing legs. 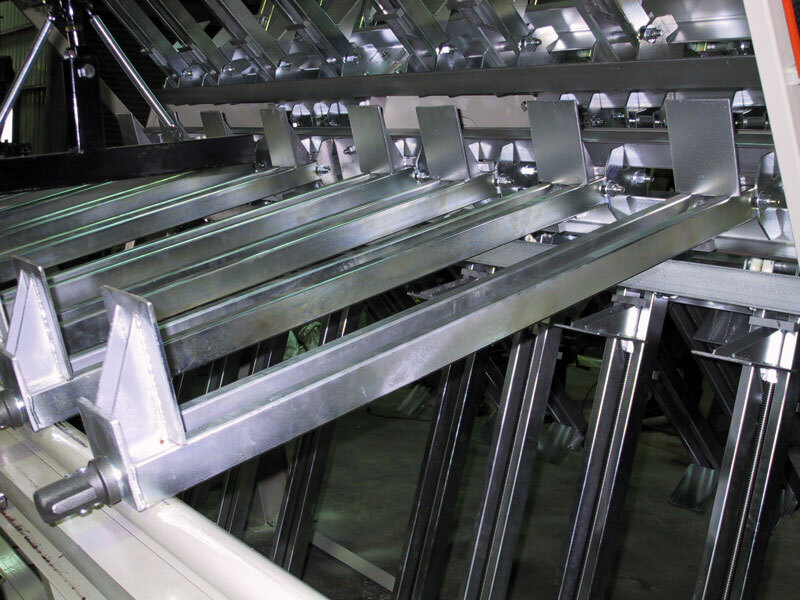 All of our steel frame components (I-beams, channels, tracks, runways, angle beams, shafts, sprockets, chains) are primed and painted with high-quality urethane for corrosion resistance and aesthetic appeal. Levelers are installed on all QUICK Clamp Carrier (and Glue Applicator) feet, making leveling of the machines quick and easy. 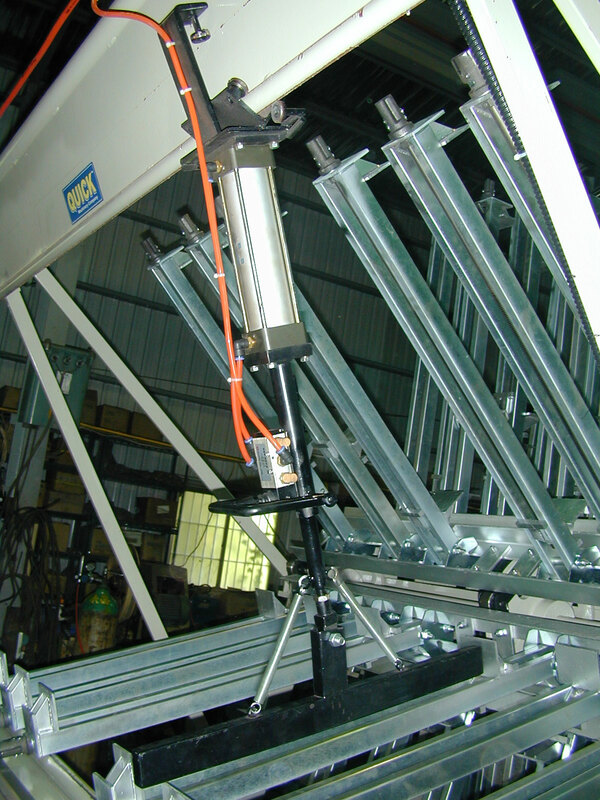 Our Clamp Carriers also feature along-the-floor cross braces for the legs, which make lagging the machine to the floor optional, but not needed. Our industrial-duty, corrosion-resistant, zinc-plated clamps have 1" x 2" rails and huge 20mm (over 3/4") screws for super strength and durability. Each clamp weighs 30 pounds, which is nearly 50% heavier than our competitors' standard clamps. Our standard clamp jaws are 4-3/4" wide by 3-1/2" high, and each is angled inward one degree to keep stock held down securely in the clamps. 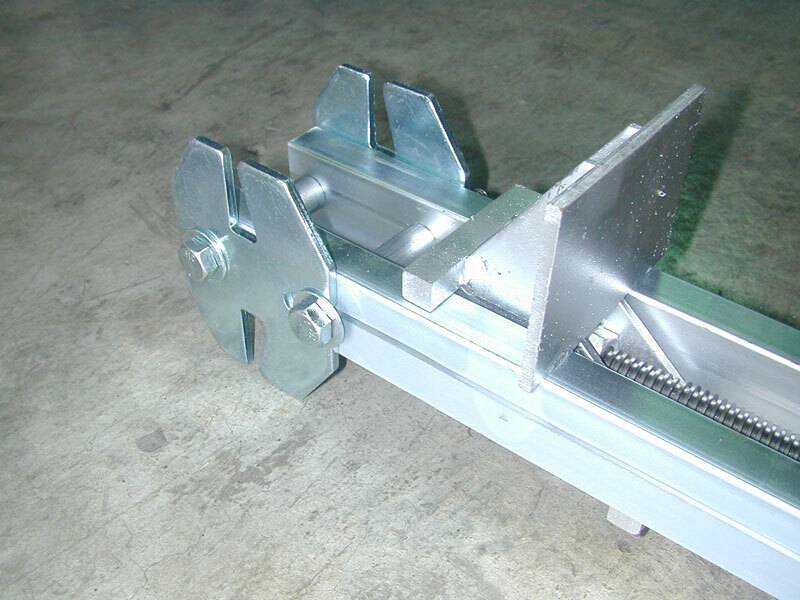 Clamp jaws are available up to 6" high (click here for a high-resolution photograph of our 6" high jaw clamp). Clamps are available from 32" to 52" opening (36" and 38" opening are most common; we've recently been standardizing on 38" clamps). To view high-resolution photographs of a standard QUICK clamp, please click on the images to the left. 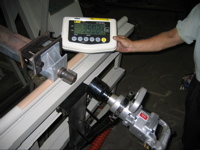 QUICK Clamp Carriers develop the highest clamping forces in the industry. Our Pneumatic Clamp Tightener (upper left photo; click to enlarge) develops over 3,800 pounds of clamping force per clamp. Our Hydraulic Clamp Tightener (lower left photo; click to enlarge) develops over 4,600 pounds of clamping force per clamp. Our primary competitor claims only 3,000 pounds of clamping force per clamp. 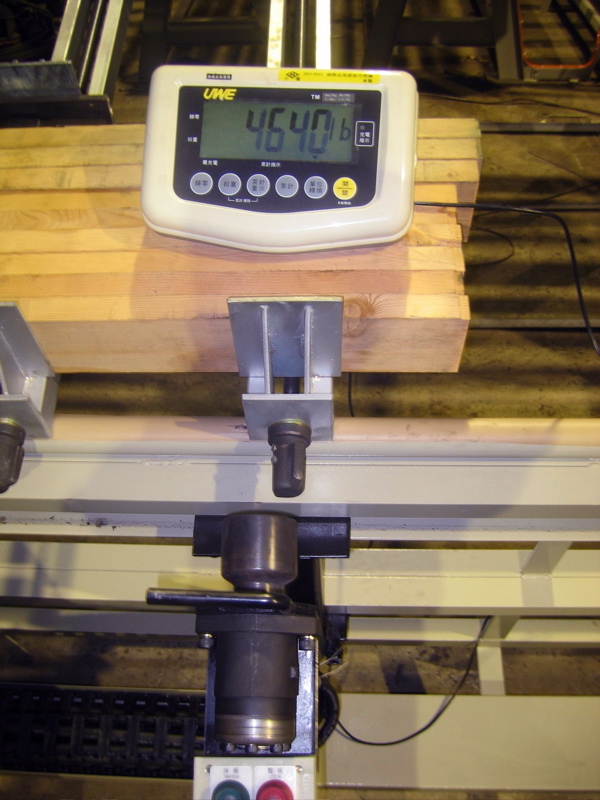 Especially if you're face-gluing heavier material, our 50% higher clamping forces will do a better job of pulling all of your gluelines up tight. And again, our super heavy-duty clamps easily withstand these higher clamping forces, day in and day out. 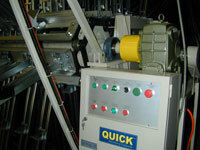 Quick Machinery Company offers a choice of three different clamp styles. Our Standard Clamp has a continuous 20mm screw for maximum simplicity, strength and durability. We also offer two styles of "quick release" clamps, with quick-release rear jaws that adjust quickly for different panel widths. 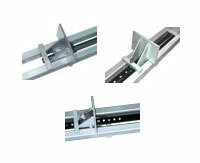 For more information on these three styles of clamps, please click on the image to the left. 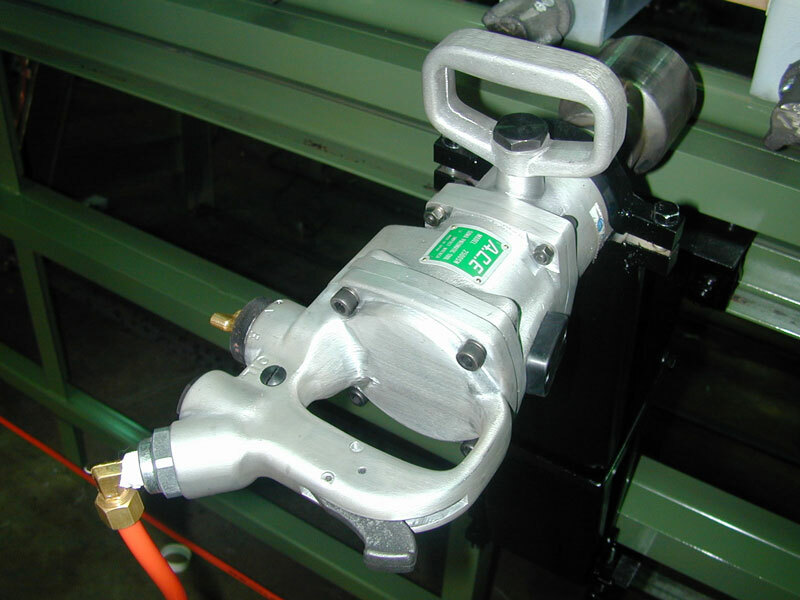 The Pneumatic Clamp Tightener rides on a ball-bearing carriage, and is actuated by an easy-press trigger. Our "out in the open" design makes it quick and easy to visually line up the Clamp Tightener driver with the clamp nuts, something that's not so easy with shrouded designs. The Pneumatic Clamp Tightener hoses are coiled for neatness. Please be aware that other manufactures may offer to you a "light duty" or "medium duty" Clamp Tightener. QUICK will not. All of our pneumatic Clamp Carriers, even our smallest ones, feature our standard, easy-to-use, industrial-strength, heavy-duty Clamp Tightener. To view a high-resolution photograph of a QUICK Pneumatic Clamp Tightener, please click on the image to the left. Be sure to compare Clamp Tightener speed, maximum clamping force, ease-of-use, and ability to take a beating (and believe me, over the next decade or so, your Clamp Tightener will take a real beating)! Our Pneumatic Clamp Tightener is featured in our 14-Section Pneumatic Clamp Carrier Movie. The Standard Hydraulic Clamp Tightener (see the first of the three photos to the left) rolls into position on ball bearings, and engages the clamps axially by being lifted up into position. 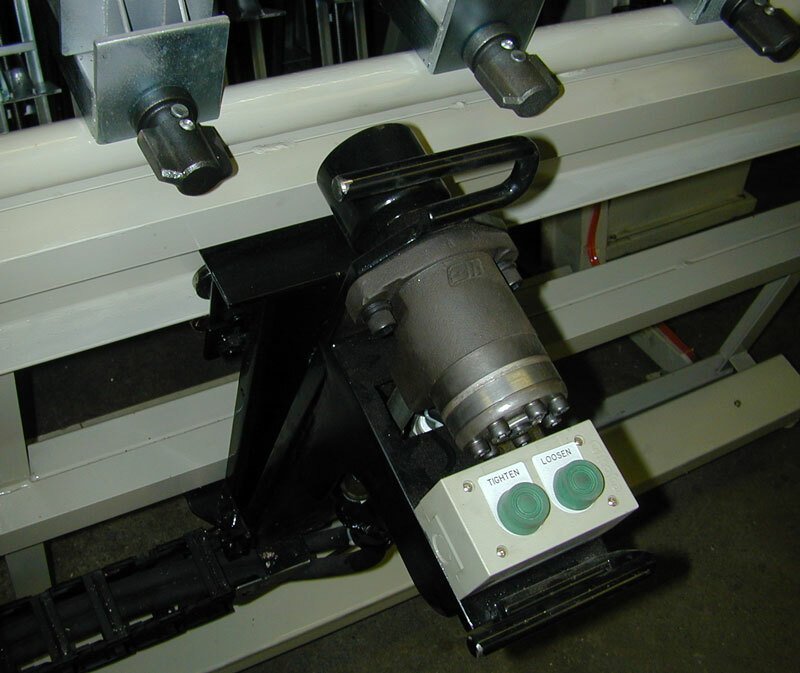 The Clamp Tightener is actuated by two easy-press buttons (tighten and loosen). 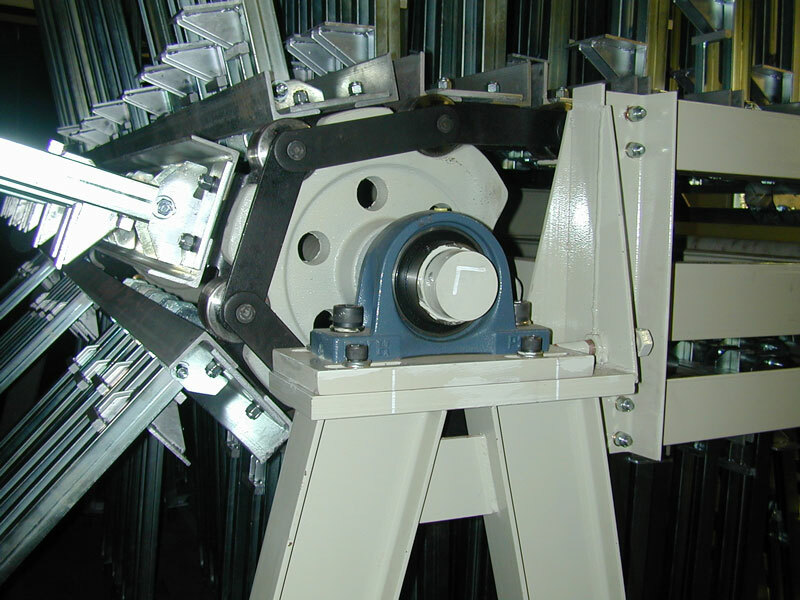 The QH Series Hydraulic Clamp Tightener (see the third of the three photos to the left) is operated entirely by one joystick. Moving the joystick to the left or right causes the Clamp Tightener/Panel Flattener carriage to move left or right via a hydraulic motor. Moving the joystick forward causes the Panel Flatteners to flatten the panel, and simultaneously causes the Clamp Tightener to move forward axially, engaging the clamp and tightening it. Moving the joystick to the neutral position causes the Panel Flatteners and Clamp Tightener to retract. Moving the joystick backward causes the Clamp Tightener to loosen the clamp. Our Hydraulic Clamp Tighteners feature Automatic Torque Limiting, which automatically shuts off the hydraulic motor each time a clamp nut reaches its optimum (preset) torque. This makes for very precise clamp tightening. When two Hydraulic Clamp Tighteners are installed, each is powered by its own 3 hp hydraulic motor and pump. The Hydraulic Clamp Tightener hoses are contained in hose tracks for protection and neatness. Flexible conduit encases and protects the electrical wires. To view high-resolution photographs of our Hydraulic Clamp Tighteners, please click on the images to the left. For close-up photos of the BH series Clamp Tightener please click here. The Standard Hydraulic Clamp Tightener is featured in our 14-Section Hydraulic Clamp Carrier Movie. 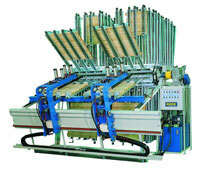 The Pneumatic Panel Flattener is used to hold panels flat while tightening the clamps. It is recommended on all QUICK Clamp Carriers. Our low-inertia, easily-positioned Flattener has a 2 1/2" diameter air cylinder for plenty of flattening power. Flattening force is adjustable via the Panel Flattener air regulator. 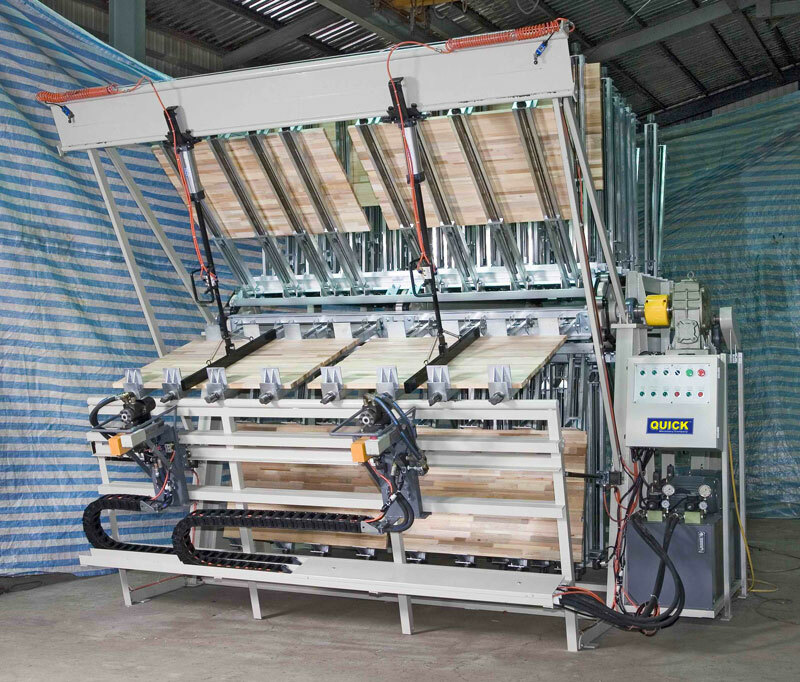 To view a high-resolution photograph of a QUICK Pneumatic Panel Flattener, please click on the image to the left. 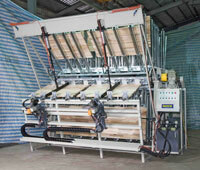 The Pneumatic Panel Flattener is featured in our 14-Section Clamp Carrier Movie. The QUICK Electric Motor Drive, which indexes the Clamp Carrier from section to section, is silent and energy-efficient. 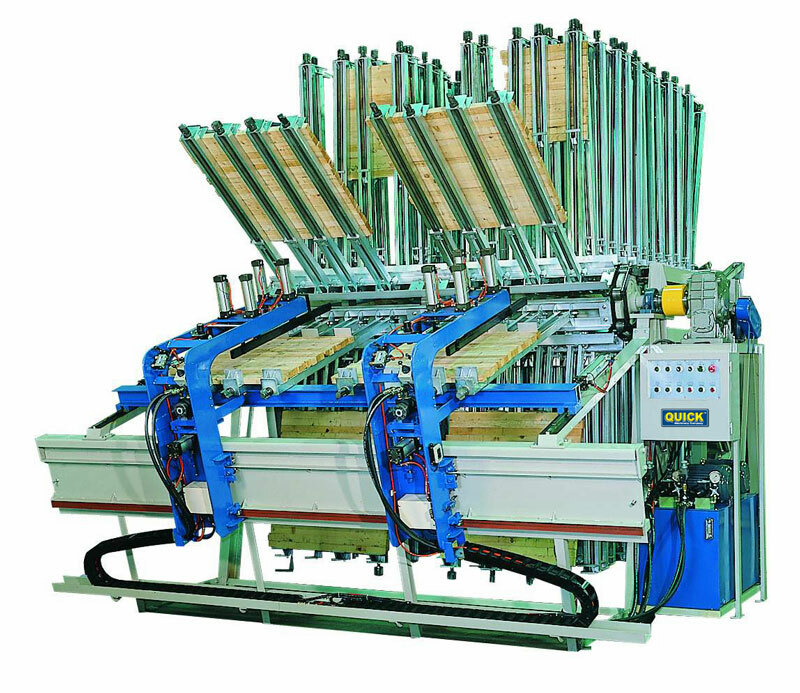 Our Automatic Carrier Rotation Cycle, standard on all QUICK Clamp Carriers with 14 or more sections, performs at the press of one button. It automatically reverses the Carrier briefly, extends the front rest pneumatic cyclinders, rotates the Carrier forward, retracts the front rest cylinders, and gently and precisely places the clamps onto the front rest. Elegantly, effortlessly, all day long. Most of our comptetitors' machines do not even have electrical systems, let alone Automatic Rotations Cycles! Many of them don't even have air cylinders to bring the front rest in and out (all of our machines do), requiring the Clamp Carrier operator to perform this operation by hand. Again, be sure to compare. Purchasing the right Clamp Carrier will save a lot of wear and tear on your operator! To view a high-resolution photograph of a QUICK Electric Motor Drive and Control Box, please click on the image to the left. The Electric Motor Drive and Automatic Carrier Rotation Cycle are featured in our 14-Section Pneumatic Clamp Carrier Movie and our 14-Section Hydraulic Clamp Carrier Movie. 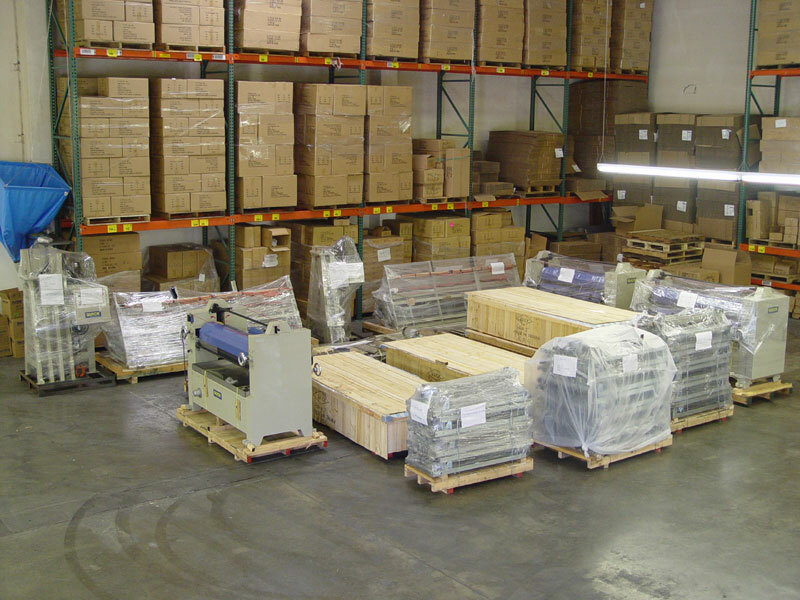 All QUICK machines are fully assembled in our factory, knocked down for shipping, and packed on steel and solid wood skids with plastic wrap. Accessories are packed in solid wood boxes. To view a high-resolution photograph of an assortment of our equipment packed for shipping, please click on the image to the left. QUICK Installation & Operation Manuals are written in plain English and include lots of pictures. Theyre written by the same guy who wrote and assembled this web site. If youve been understanding what youve been reading so far, youll probably understand the manual, too. 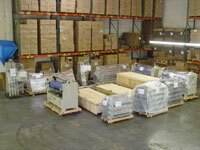 Our customers usually unpack and assemble their machines themselves. Most of the subassemblies, bolts, hoses and wires are left attached for easy hook-up. To learn more about our manuals, or to download PDF versions of our manuals, please click on the image to the left. Every one of our Clamp Carriers comes with its own toolbox, filled with tools, grease, touch-up paint and spare parts. We love details. Can you tell? 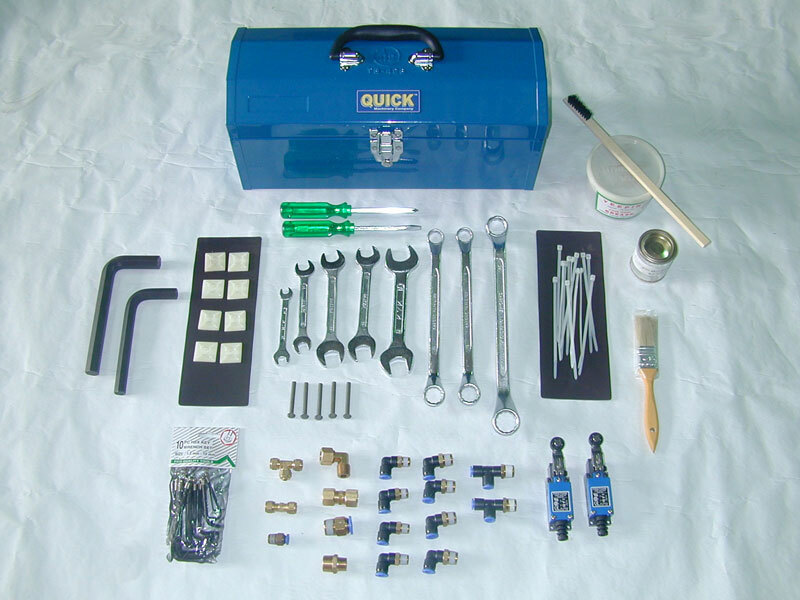 To view a high-resolution photograph of the QUICK toolbox and its goodies, please click on the image to the left. Still have questions? Dont forget to visit our Clamp Carrier Frequently Asked Questions page!